Paddle through time in a REAL ‘Jurassic World’ Adventure!To Mark Steven Spielbergs epic new film ‘Jurassic World’ being launched in 2015. Jurassic coast activities will be running extra tours during the year with something a little extra added to all those signed up to our social media through Facebook and twitter. Be part of one of the UKs top water activity attractions! 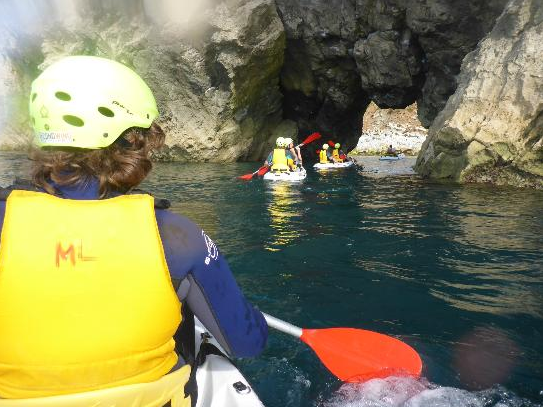 Originally established in 1986 Jurassic Coast Activities have become the premier supplier of Kayaking tours and Coasteering on Dorset's Jurassic Coast. They also have a Retail, Hire Centre and accommodation booking office situated at Overcombe Beach, Weymouth and thier activity Centre situated in Lulworth Cove, Dorset provides Jurassic Kayak Tours and Jurassic Coasteering Tours. With two locations and their on the beach parking, pristine water, incredible coastline and great local amenities our locations are a great place to spend the day...... or weeks! They are the only company permitted to operate out of Lulworth Cove and enter the local caves! If you are looking for a great experience in kayaking and Coasteering in Dorset you have found the right place, they have specialist instructors which have years of experience, are extremely professional and will regard your safety with the upmost importance yet still retaining a relaxed and fun attitude. Go and visit Jurassic Coast Activities and then come and pop into taste* Chesil for lunch or afternoon tea. Or why not start the day off with a taste* chesil breakfast and then go explore Weymouth and Portland. Visit the Jurassic Coast Activities website here.